Description: A soothing, refreshing, and mildly disinfecting blend Of 100% certified organic, fair-trade, pure and natural essential oils. This can be used not only on yoga mats, but also in bathrooms, on sporting gear, in your car, in the air to freshen, and to clean and help with germs. Ingredients: 100% certified organic, fair-trade, pure and natural essential oil of Lavender (from Provence, France), Eucalyptus, Peppermint, Tea Tree & Lemon, Grapefruit seed extract, in a base of distilled water and premium alcohol. Directions: Shake well before using. Spritz a bit away from item. 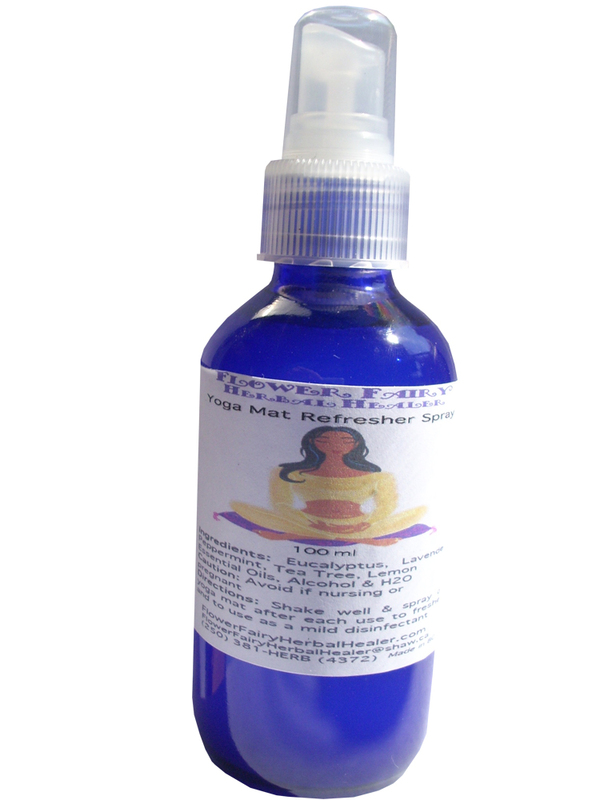 Use on your yoga mats before and after use, to freshen mats and as a mild disinfectant. This can be used in the air to freshen, clean and help with germs. It may also help freshen plastic shower curtains, flip-flops, and shoes. Cautions: Avoid if nursing or pregnant or if you have Epilepsy. Avoid using on delicate fabrics like silks or satins - the oils may stain.